Juveniles generally aged 12 or older but younger than 26 and with serious physical/mental disabilities. Juveniles who are not suitable for short-term treatment program (maximum term of confinement, in principle, of two years). The type of juvenile training school is designated by a family court following the ruling to commit them to a juvenile training school. In addition, a family court can recommend short-term treatment programs upon that ruling if deemed appropriate, and in which case the treatment program is then determined in accordance with that recommendation. In any other cases the juveniles receive long-term treatment program. Table 3-2-4-8 shows the number of juveniles newly admitted to juvenile training schools in 2011 by type of juvenile training school and treatment program. Treatment courses are established with both general short-term treatment program and long-term treatment program (with further divisions of the treatment courses also being available within the long-term treatment program). All the juveniles in juvenile training schools are provided with guidance in five areas of correctional education, namely daily life guidance, vocational guidance, academic education, health and physical education, and special activities. However, they categorize each juvenile to one of the treatment courses each of which is set with different weight of priority on each of these five areas of correctional education, according to the criminal tendency, academic ability, future plans, and physical and mental condition of each juvenile to implement the treatment in the manner most effective (medical treatment has priority in the medical treatment course). The treatment course also notes the key matters that require attention in the course of implementing the correctional education. Table 3-2-4-9 shows the type and subject of treatment courses, etc., along with the number of juveniles newly admitted to juvenile training schools by treatment course, etc. in 2011. Correctional education is the core treatment provided at juvenile training schools and involves the five areas of daily life guidance, vocational guidance, academic education, health and physical education, and special activities. Those considered unable to adapt to society due to a physical or mental disability are provided with medical care. In addition, the treatment at juvenile training schools is further divided into the three educational stages of orientation, intermediate, and pre-release. Correctional education is implemented based on individual treatment plan for the juvenile specifically laid out by the director of pertinent juvenile training school with the goals, basic content, and methods to be used at each stage. 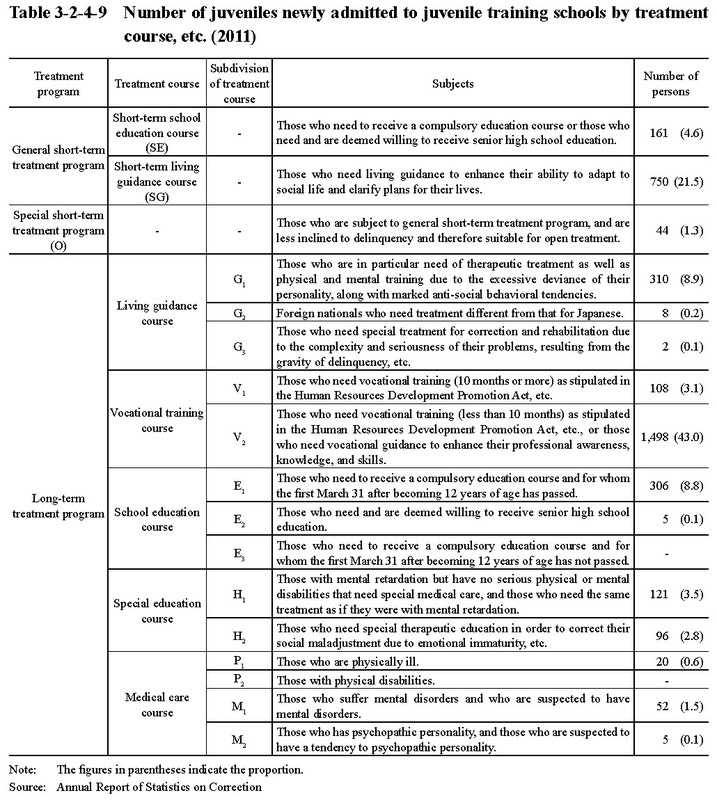 Treatment grades are established for juveniles at juvenile training schools in thus facilitating their reformation via raising their motivation to make voluntary efforts (the treatment grades are divided into first to third grades, with the first and second grades being divided again into upper and lower grades). Newly admitted juveniles are first placed in the lower second grade before moving on to the other grades in accordance with the progress they make in their reformation. Restrictions in their lives are accordingly also alleviated in the respective grades. The content of the abovementioned guidance within the five areas is as follows. Daily life guidance is implemented on the following issues:  problems related to the juveniles’ awareness, attitude, and behavior that can thereby lead them into delinquency,  problems related to the juveniles’ predisposition and emotions, etc.,  the cultivation of sensitivity,  the basic lifestyle, attitude of law-abidance and self-discipline, and interpersonal relationships, etc.,  their environment (relationship with their families and friends, etc. ), and  selecting a career or academic course in the future, life planning, and preparation for social reintegration, through various methods that include counseling, guidance on writing essays and a diary, role lettering, and introspection, etc. In addition, “education with the victims’ point of view” has been improved and enhanced in thus aiding juveniles to better understand the delinquent acts they committed, the seriousness of them, and thus the victims’ feelings, etc., thereby enabling them to be more capable of responding to the victims in a sincere manner. Juvenile training schools currently offer vocational guidance through courses that include welding, woodwork, civil engineering and construction, operation of construction machinery, agriculture and horticulture, office work, and caretaking services, etc. 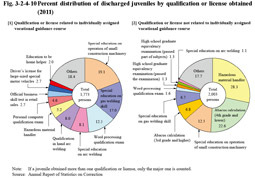 In 2011, 48.9% of discharged juveniles obtained qualifications or licenses related to their individually assigned vocational guidance course, while 55.3% obtained other qualifications or licenses. Fig. 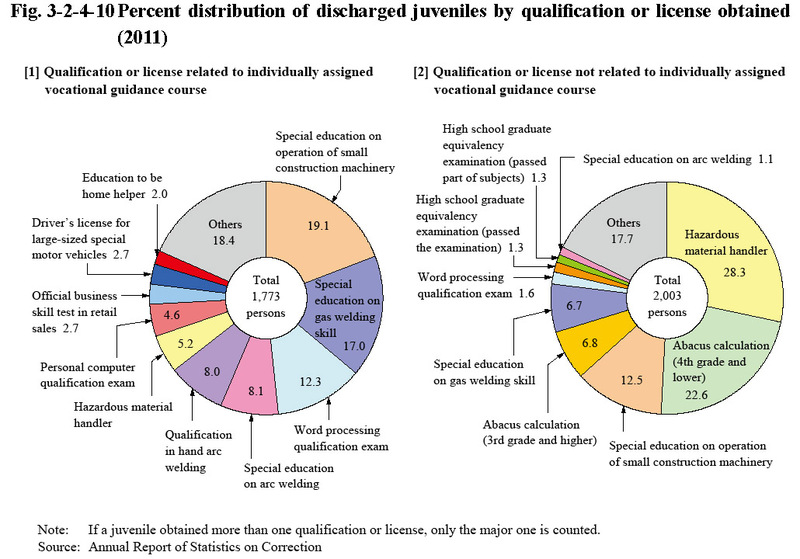 3-2-4-10 shows the percent distribution of juveniles discharged in 2011 by qualification/license obtained. Since FY 2006 the Ministry of Justice has, in cooperation with the Ministry of Health, Labor and Welfare, been implementing comprehensive employment support measures for persons released from prisons, etc., and as part of which has been providing vocational counseling, etc. by public employment security office staff members. Juveniles at juvenile training schools who did not complete their compulsory education or those who need and wish to receive a senior high school education are provided with an academic education that is the equivalent of that which they would receive at school. An academic education is also provided to all the other juveniles as supplementary education, if required, and in thereby helping them to acquire the basic scholastic abilities needed to lead a normal social life or to proceed to a higher education or return to the school to which they previously belonged. Some institutions implement compulsory education or senior high school education through academic education programs that are entrusted to external schools, etc. Of juveniles discharged in 2011, 138 returned to junior high school and 128 to senior high school, while a total of 289 juveniles received graduation certificates of junior high school while in a juvenile training school (Source: Annual Report of Statistics on Correction). A Certificate for Students Achieving the Proficiency Level of Upper Secondary School Graduates (high school graduate equivalency examination) has also been made available at juvenile training schools since FY 2007. In FY 2011, 418 juveniles took the examination, with 126 having passed the examination and 269 having passed part of the subjects (Source: The Lifelong Learning Policy Bureau, Ministry of Education, Culture, Sports, Science and Technology). Doctors and medical staff, etc. at juvenile training schools provide health education on disease prevention, etc. in thus enhancing the juveniles’ ability to maintain good health, giving consideration to their delinquency and actual living conditions before admission, etc. Various sporting activities are implemented through physical education in enhancing their basic physical capabilities, concentration, patience, and endurance, with group games being utilized in order to develop the ability to comply with rules and to consider the others in interpersonal relationships, etc. Special activities at juvenile training schools include  voluntary activities,  extramural educational activities,  club activities,  recreation, and  other events. As voluntary activities, and at most of the juvenile training schools, juveniles are assigned roles of the day manager, book manager, maintenance manager, or recreation manager, etc. (role playing activities) in thus developing greater autonomy and a cooperative spirit. In addition, meetings and homerooms are held and school bulletins, etc. are published. Social service activities and field trips, etc. are also implemented as extramural educational activities. As social service activities, many institutions implement volunteer activities at welfare facilities and cleaning/beautification activities at nearby parks and public facilities, etc. (3) Measures for custodians, etc. Custodians play a significant role in the reformation/rehabilitation of juveniles, and hence juvenile training schools are now providing instruction and advice that can help custodians cope with problems concerning the delinquency of the juvenile inmate, making information on correctional education available, and holding custodian meetings. A wide variety of private volunteers, including volunteer visitors, chaplains, members of the Women’s Associations for Rehabilitation Aid, and members of BBS associations, etc., are involved in support activities at juvenile training schools. Volunteer visitors provide juveniles with advice and guidance on mental problems they have along with cultural instruction, etc. As of the end of 2011, 608 persons were commissioned as volunteer visitors for juvenile training schools (Source: The Correction Bureau, Ministry of Justice). Chaplains provide religious education upon request. As of the end of 2011 juvenile training schools entrusted religious education to a total of 368 chaplains (Source: The Correction Bureau, Ministry of Justice). Members of the Women’s Associations for Rehabilitation Aid and members of the BBS associations, etc. are also of support in the treatment at juvenile training schools in a variety of ways. For example, they regularly visit juvenile training schools to participate in school events such as birthday parties, cherry blossom viewing parties, and Coming of Age ceremonies, or to play games and take part in sporting activities with the juveniles or participate in debates as judges. Interactions with these volunteers can serve juveniles as significant encouragement to rehabilitate themselves.